Technology — especially when it comes to media — is usually equated with progress, in which one format innovation replaces another, enhancing the user experience. Well, a funny thing happened in the world of music. The compact disc (CD), which was supposed to supplant the traditional vinyl record in the marketplace as the superior option, has itself been rendered obsolete by digital sales. As for the LP, to paraphrase Mark Twain, reports of its death have been greatly exaggerated. On L.A.’s Westside, record shops left standing after years of struggling to survive the digital age are riding the wave of a national resurgence of interest in vinyl. On Saturday, wax specialists Soundsations in Westchester and Record Surplus and Touch Vinyl in West Los Angeles will participate in the annual brick-and-mortar booster National Record Store Day — only this time around, sales of music issued and re-issued in the classic LP format are not just about surviving but thriving. In June 2013, The New York Times was among media outlets declaring a vinyl revival, gauged in equal parts by record sales, a vinyl fascination among listeners born after 1980 and a burgeoning trend of new pressing plants. According to the Times, Nielsen SoundScan estimated that 19,000 of the 339,000 units sold on the mid-May 2013 release of Daft Punk’s “Random Access Memories” (featuring the megahit “Get Lucky”) were on vinyl. Other albums experiencing disproportionate LP success included Vampire Weekend’s “Modern Vampires of the City” (which sold 10,000 on vinyl that same week) and the National’s “Trouble Will Find Me” (with 7,000). Catalog albums by perennial favorites such as The Beatles, The Rolling Stones and Bob Dylan are constantly being reissued. Meanwhile, many young companies have joined venerable record manufacturers in the current marketplace. 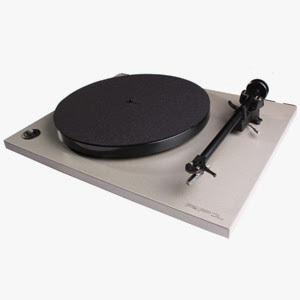 Brooklyn Phono, a New York City company launched in 2000, manufactures nearly 500,000 LPs annually, while Quality Record Pressings in Kansas, established in 2011, generates 900,000 a year, including reissues of Nirvana, Jimi Hendrix and Eric Clapton for major labels. Canoga Park-based Rainbo Records churns out 7.2 million yearly. Since its inception in 1972, Soundsations Records has changed ownership three times and moved around several locations in Westchester. After working at Soundsations for three years, childhood friends Pete Grasso and Lee Wilson, both 27 at the time, bought the store in 1990. Until recently, the store stood two blocks away on Sepulveda, but after being chased out of the location by higher rents, it occupies a corner spot on La Tijera Boulevard. But things began improving drastically about four years ago, he said. Record Surplus, an anchor of the Westside vinyl scene since 1985, has also changed hands and locations over the years. Longtime employee Neil Canter took over Record Surplus from former owners Mike Colestock and Chuck Rose in 2008 after the store’s landlord died and his children “put the building up for sale and not at our price range,” Canter recalled. In their 70s and facing the prospects of rising rent, a 10-year lease and the store’s probable relocation, Colestock (who also owns Rhino Records in Claremont) and Rose (whose family owns the Chicago chain Rose Records) sold Record Surplus to Canter, who now runs the store with wife Cheryl Perkey. Canter, who came aboard Record Surplus in 1986 and became manager in 1989, remembers a time when there were two Record Surplus stores in Las Vegas, one in Costa Mesa and one neighboring the Whiskey-A-Go-Go in West Hollywood. Even during lean years that followed the L.A. Riots and during the recent recession, “We still always sold a lot of records,” Canter said. “We never gave up on vinyl. The ancillary Record Surplus branches were gone by the time Canter assumed the flagship West L.A. shop, which in 2011 did relocate from its Santa Monica-adjacent Pico Boulevard and Barrington Avenue location to its slightly bigger current space on Santa Monica Boulevard near Centinela Avenue. Touch Vinyl’s Mathews, 32, may be the newbie among these shop owners, but his business arguably has the most offbeat of origins. Mathews used to represent screenwriters and work in development at J. J. Abrams’ production company, Bad Robot. However, he found working in Hollywood soul-sucking. After quitting entertainment, Mathews traveled to Scandinavia, where he wandered into the record shop 12 Tonar in Reykjavik, Iceland. Upon returning to the States, Mathews set up shop on Sawtelle Boulevard near Idaho Avenue, just west of the 405, with no qualms about jumping into the vinyl biz in 2012. The vinyl resurgence also extends to the original Scratch DJ Academy, co-founded in 2002 by legendary turntablist Jason “Jam Master Jay” Mizell of pioneering rap group Run-DMC and located near Pico along the 405. In an age where scratching has fallen out of vogue in rap songs while most electronic dance music deejays sequence their music from MacBooks, vinyl is still vital to many in the trade, with shop owners confirming that Scratch students and alums still frequent their shops. 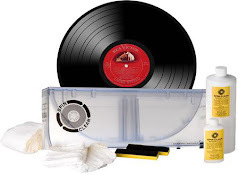 Gary Freiberg, a vinyl enthusiast who in 2002 successfully campaigned for an official declaration of Vinyl Record Day in San Luis Obispo County and has patented a method for framing album covers, said digital technology hasn’t caught up with vinyl’s historic music catalogue. Just as the CD’s format eliminates levels of sound heard on vinyl in order to simplify it into data, CDs have also thinned out catalogues of various musicians. Freiberg noted that many LPs by such artists as Otis Redding and Marvin Gaye and only a small fraction of all music ever recorded have been released as CDs. According to the advocates of traditional albums, it’s not only the aural that’s augmented by records, but also the visual experience. Freiberg proudly recalls meeting Alex Steinweiss — who around 1940 convinced Columbia Records to replace brown paper sleeves with adorned packaging — shortly before the New York graphic artist’s death in 2012. Forward-thinking musical acts have long supported records, even through the doom-and-gloom 1990s. Jack White, who owns a Nashville vinyl store, recently discussed its charms at length on the VH-1 Classic appraisal show “For What It’s Worth.” The Arcade Fire and M83 also exploit the format. If National Record Store Day, with its promotional giveaways and discounts, is just a gimmick, it has been an effective one. “It’s been very good for our store. We’ll have 30 to 40 people waiting outside before we open. It really pushed the whole industry,” Soundsations’ Grasso said. Past events at Touch Vinyl have included a cook-out and a food truck. This weekend, there will be deejays and ice cream. “I try and find something to give away,” said Record Surplus’ Canter, who has stored up a palette of original programs from 1970s and 1980s concerts by the Ohio Players, the Beach Boys and the Steve Miller Band. Record Surplus will also offer deals such as three records for 92 cents and 15% off certain merchandise. National Record Store Day has kept up the annual push each April since 2007. This year, Public Enemy frontman Chuck D. serves as the day’s national ambassador, backed by testimonials from musicians Ziggy Marley, Bonnie Raitt, Jeff Tweedy, Joan Jett, DJ Jazzy Jeff and Regina Spektor. But not everyone sees RSD as purely altruistic. Mathews acknowledges the holiday has grown up a bit. Canter said some customers only show up on Record Store Day to snag promotional gifts—some of which, Freiberg said, simply end up on eBay. However, most agree about National Record Store Day’s upside: It bonds record dealers with customers as well as other vendors. 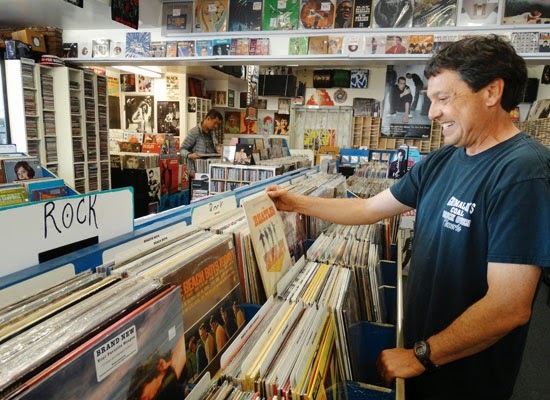 On the Westside, frequent in-store activities keep the vinyl vibe going year-round. On Thursday nights, Mathews hosts open tables for deejay sets. Mathews has seen all genres of DJs step up — hip-hop, house and electronic dance music — but “one of my favorites was a husband-and-wife team that had no real experience but a great collection of Scandinavian death metal,” he said. Touch Vinyl also throws in-store concerts. On Friday, singer-songwriter Kyle Neal and indie band Inner Wave perform. Santa Monica experimental rockers Opus Orange visited the store earlier this year just prior to performing at the South by Southwest music, film and technology festival in Austin. Record Surplus also recently added in-store concerts, starting with Kat Lenz and Her Jaguars in December and, last month, The Outta Sites. “There’s only a few record stores left that I feel really comfortable in — The Bop Shop in Rochester, N.Y., Hymie’s in Minneapolis, and Record Surplus,” said Pete Curry, a member of the newly formed Outta Sites and the venerable band Los Straitjackets, which last year issued National Record Store Day limited-edition 45s. Mathews said many Touch Vinyl customers skew younger and he encourages them to assist the careers of local acts. Rap crew Warm Brew and Moses Sumney are among the acts passing through Touch Vinyl who have benefited from such support. If anything, 2014 is a time for optimism regarding the fate of the classic licorice pizza. For Mathews, the second coming of vinyl isn’t a fad — it’s a new beginning. Special thanks to author Michael Aushenker and ArgonautNews.com for allowing this reprint. This story originally ran in the April 17 issue of the Argonaut weekly newspaper in Los Angeles, which covers eight coastal communities on L.A.'s Westside including Santa Monica, Venice and Marina del Rey. It was originally written to correspond with National Record Shop Day.